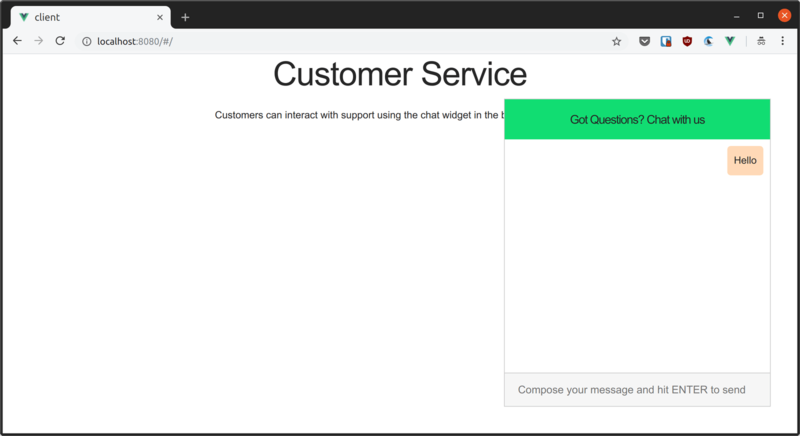 In this tutorial, I’ll describe how you can use Vue.js and Chatkit to build a realtime customer service chat app. Good customer service plays an important role in the growth of any business. In today's world, it is important to offer some sort of live chat interface so that you can offer prompt responses to the customers who want to ask questions about your business. If you’re looking to get a live chat system up and running for your customers, Chatkit makes it easy to do with just a few lines of code. Before you continue with this tutorial, make sure you have Node.js (version 8 or later) and npm installed on your computer. If not, you can find out how to install it for your operating system here. In addition, you need to have prior experience with building Vue.js applications, but no knowledge of Chatkit is assumed. Head over to the Chatkit page and create a free account or sign in to your existing account. By doing so, you’ll be able to create a new instance for your application and manage your credentials. Once you’re logged in, create a new Chatkit instance for your application, then locate the Credentials tab on your instance’s dashboard and take note of the Instance Locator and Secret Key as we’ll be using later on. You can also create users programmatically, but creating users from the dashboard inspector is useful for testing purposes. Once the dependencies have been installed, create a new .env file in your project root and add in the credentials retrieved from your Chatkit instance dashboard. We have two routes on the server: the /users route takes a userId, and creates a Chatkit user through our chatkit instance while the /authenticate route is meant to authenticate each user that tries to connect to our Chatkit instance and respond with a token (returned by chatkit.authenticate) if the request is valid. That’s all we need to do on the server side. You can start the server on port 5200 by running node server.js in the terminal. We’ll be making use of Vue CLI to bootstrap the application frontend. Install it globally on your machine, then use it to create a new Vue.js app in the root of your project directory. When prompted, use the default preset (babel, eslint). 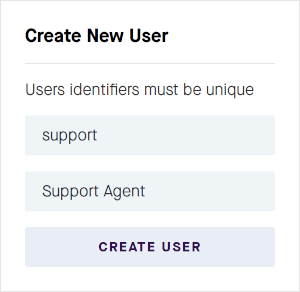 Our application frontend will have two views: one for the customer and one for the support staff. To switch between the two views, we’ll be making use of vue-router which we already installed in the previous section. Before we go further, let’s add some styles for our applications. We’re making use of the skeleton-css boilerplate to add some basic styling, and complementing it with our defined styles in client/src/App.css. Once the user hits the CONTACT SUPPORT button, a dialog should appear requesting the name of the user. This name will serve as the userId for connecting to our Chatkit instance. 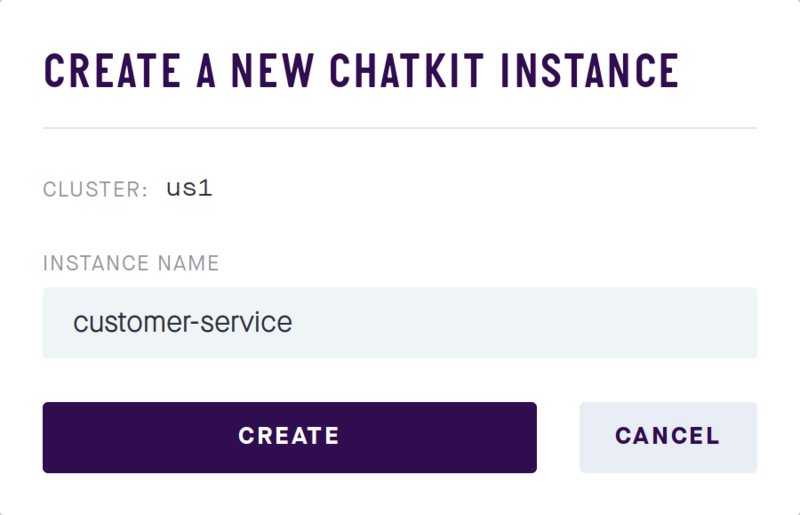 Be sure to update the <your chatkit instance locator> placeholder within the launchChat() method before proceeding. Now, you should be able to launch the dialog by clicking the contact support button. If you enter a username and hit SUBMIT, we connect to our Chatkit instance and get a currentUser object which represents the current connected user. At this point, we need to show a chat widget so that the user can begin to chat with the customer service agent. Once the currentUser object is set in the application state, we create a new room for this chat session via the createRoom() method. We’ve opted to make the room private in this instance so that only the user and support staff are able to access it. Once the room is created, we have to connect to it before we can send any messages. This is done via the connectToRoom() method which takes the ID of the room that was created and adds the user to the room. Chatkit’s room subscription hooks allow us to perform actions when some event occurs in the current room. In this instance, we’ve set up the onMessage hook to append new messages to the messages array so that the new message is displayed in the chat widget. Finally, we add the support agent to the room via the addSupportStaffToRoom() method which means that the support agent will be able to login to their own interface and see all ongoing conversations instantly. At this point, you should be able to use the chat widget to send and view messages seamlessly. :class="[currentRoom && currentRoom.id === room.id ? 'active' : '']"
The support agent needs to be able to interact with multiple customers at once, so we have a sidebar where all the connected users are listed, and the main chat area for sending and viewing messages. We’re immediately connecting to the Chatkit instance on page load (via mounted()) and listing all the connected customers in the sidebar. We can jump between chats by clicking on each room name via connectToRoom() . This method simply connects to the selected room and changes the value of currentRoom so that the screen is updated appropriately. Thanks to the onAddedToRoom() connection hook, we do not need to refresh the support view to see new chats that have been initiated. Everything is updated in realtime without much effort on your part. Before testing, make sure to update the <your chatkit instance locator> placeholder within the mounted() method. In this tutorial, I've shown you how to set up a customer support application using Vue.js and Chatkit. You can checkout other things Chatkit can do by viewing its extensive documentation. Don't forget to grab the full source code used for this tutorial in this GitHub repository.